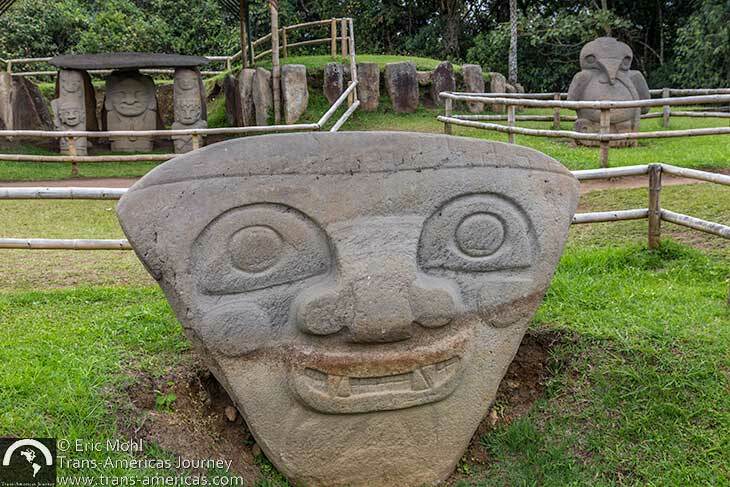 The San Agustín Archaeological Park in the town of San Agustín, Colombia is home to a collection of stone statues with a secret that makes this archaeological site even more compelling than most. 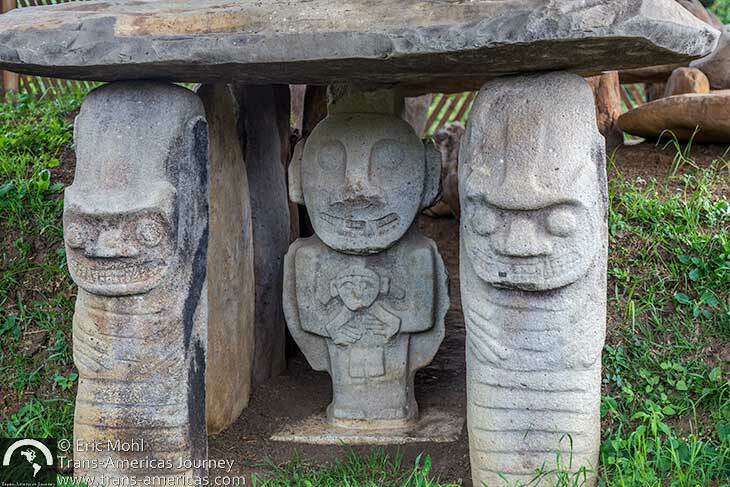 These carved statues are guarding a tomb at the San Agustín Archaeological Park in Colombia. But why? 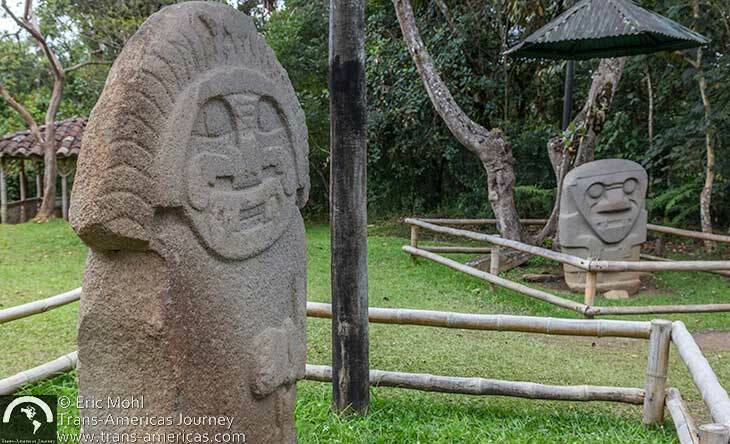 In 1995 the San Agustín Archaeological Park (25,000 COP, about US$8.50, for a ticket that’s good for two days and includes other sites we talk about later in this post) was named a UNESCO World Heritage site. It’s home to what’s been called the biggest collection of pre-Columbian religious monuments and sculptures in South America. It’s also considered the largest necropolis in the world. 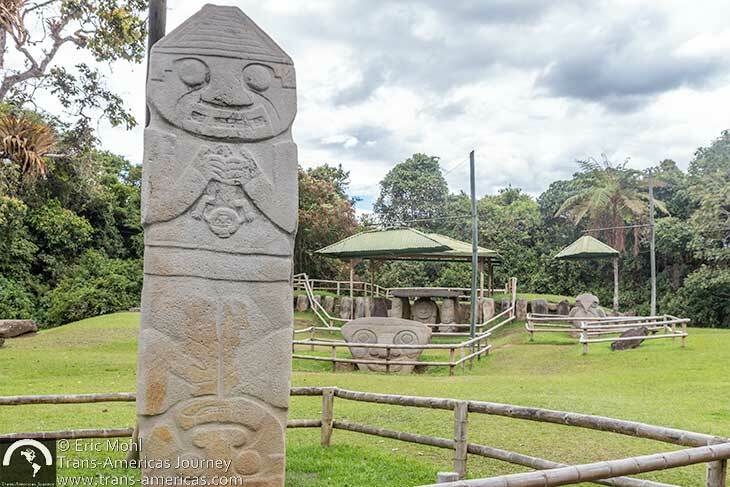 The peaceful setting of the San Agustín Archaeological Park in Colombia makes it feel more like an art-filled sculpture park than an archaeological site. 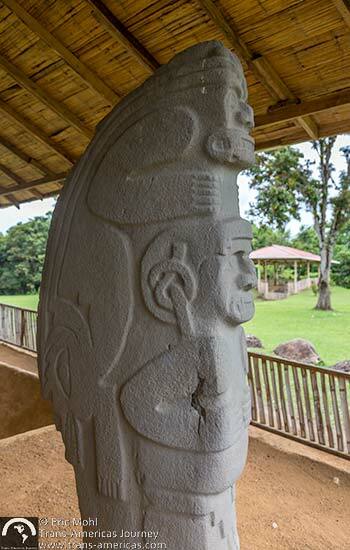 A stele-like megalithic sculpture at the San Agustín Archaeological Park. All of that is a fancy way of saying this place is full of really old graves, thought to have been created between the 1st and the 8th century AD, which are marked with carved stone statues, some of which are enormous and weigh many tons. And no one knows all of their secrets. Exactly why and how were the graves created? Who’s buried there? And what are the stone figures all about? Stone statues guarding another mysterious tomb. Images carved into stone varied greatly and included animals, faces like this, and fantastical creatures. That’s a lot of hype to live up to, but we were immediately impressed. 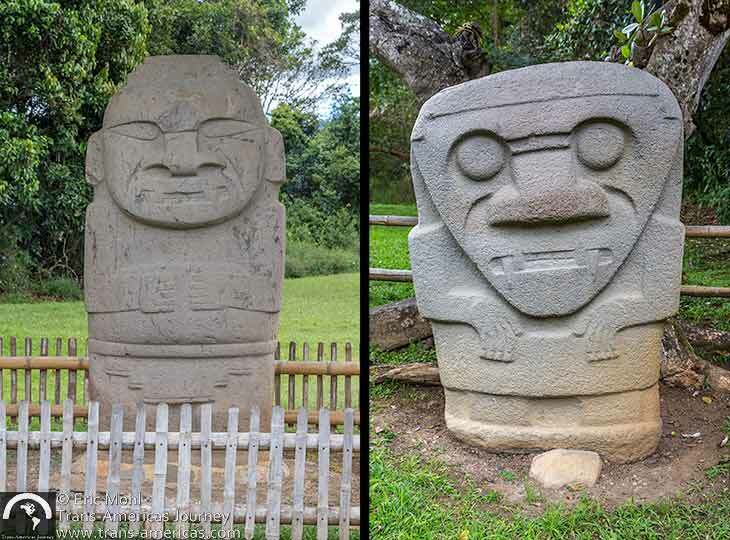 The site, located about 2.5 miles (4 km) from the town of San Agustín covers about 290 acres (116 hectares) in total, but the area that’s been set up to visit covers just a few acres where you can see 130 stone statues (out of the 500 or so in the area in total). 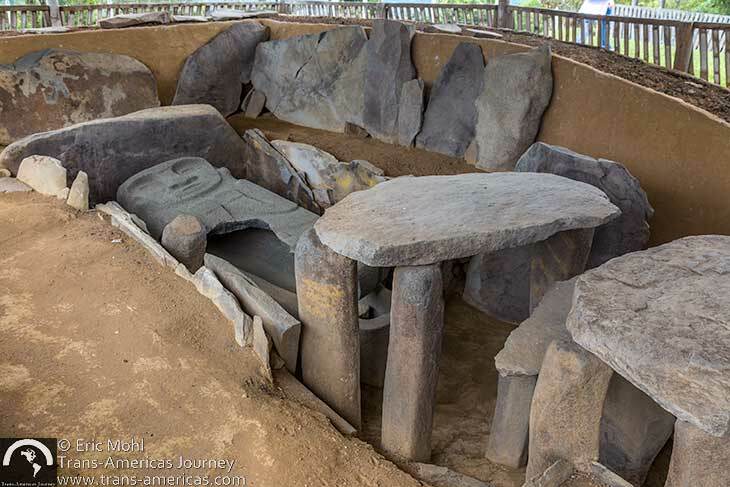 Mesita A, B, C, and D, which are funeral complexes, clearings with groupings of sculptures, and tombs in situ, have the majority of large sculptures and tombs. 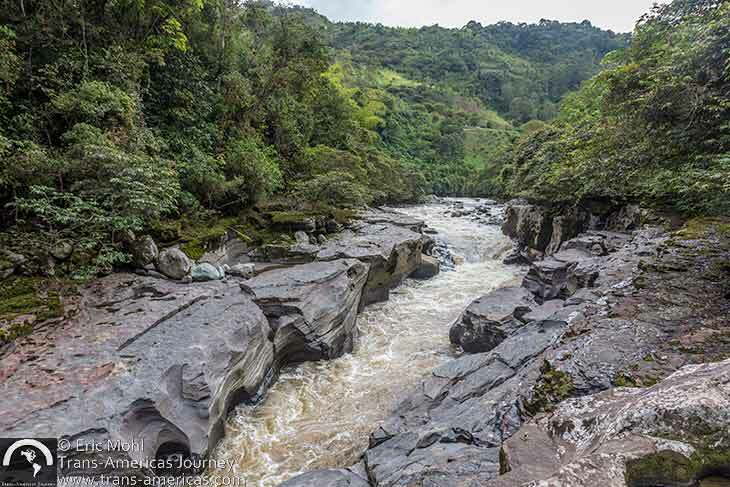 Don’t miss the ceremonial Fuente de Lavapatas which features figures carved into rocks in a flowing stream bed. Visiting Alto de Lavapatas, home to a group of stele-like carved stones, requires a climb to a plateau. The Bosque de Estatuas trail winds among 39 carved stone figures and is sloping, and mostly shaded. Most of the carvings depict humans or fantastical animals but this bird was pretty true to life right down to the worm (or snake?) in its beak. It’s a peaceful setting for the amazingly distinct and intact stone statues. 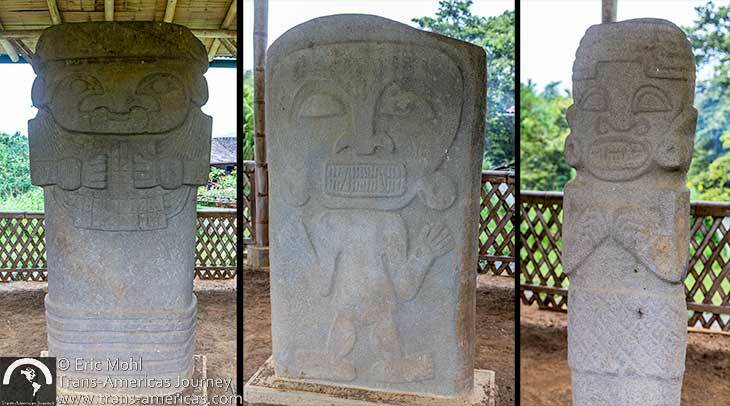 We were amazed at how much the carving styles differed from stone to stone and many areas were more like outdoor sculpture gardens or very mysterious cemeteries rather than archaeological sites. 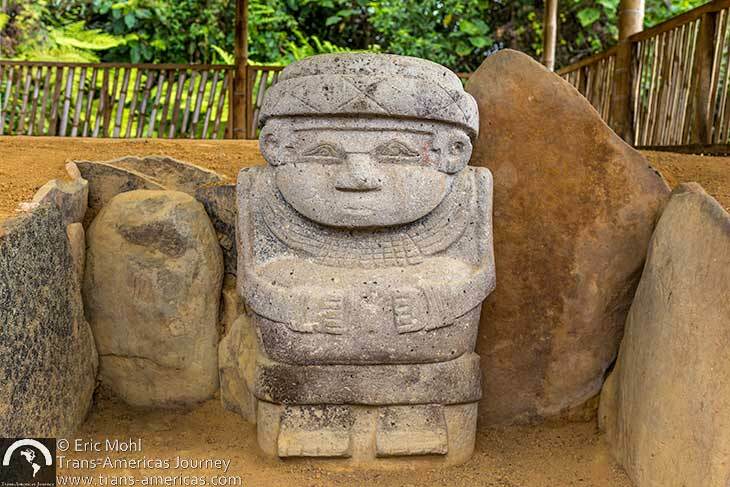 You will see a wide range of styles in the carvings at the San Agustín Archaeological Park. 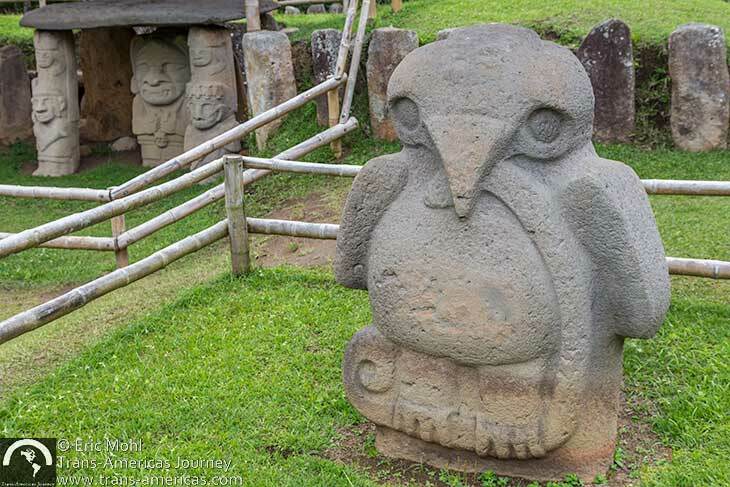 By the time you get to San Agustín, there may be even more stone figures to admire. 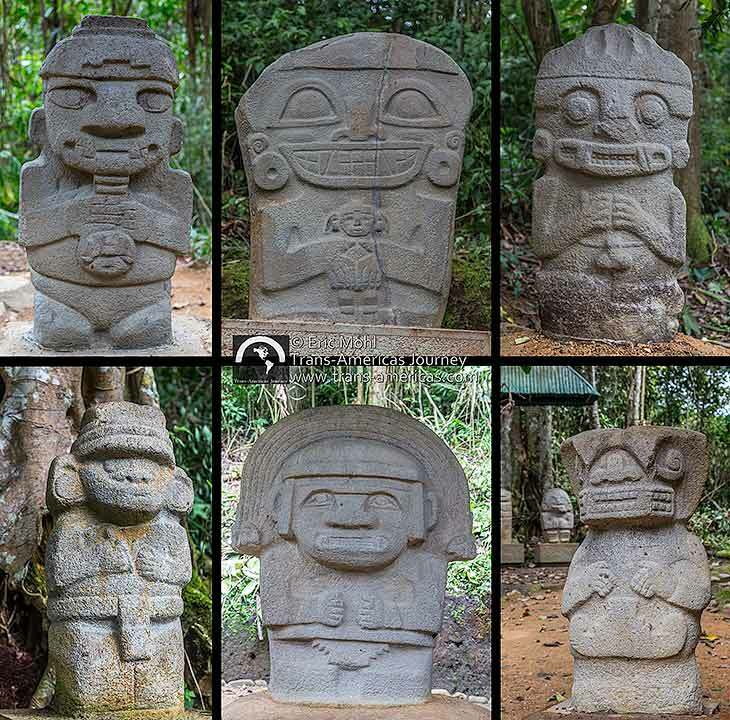 In July of 2017 the Colombian government asked for the return of 35 statues from San Agustín which are currently in a museum in Germany. Also, when we were at the site the museum was closed and a new facility was being finished. Even without the museum, we spent 2.5 hours at this site. Be sure you’ve set aside enough time for a thorough visit. Taxis and minibuses go from town to the site, which gets busy on weekends though there were only about 20 other people at the site when we visited on a Tuesday. It’s hard to believe these two very different versions of humans were found at the same archaeological site. Your ticket to the San Agustín Archaeological Park also covers a few smaller sites nearby, so bring your ticket with you as you explore the area. Stone statues at the El Tablon site. 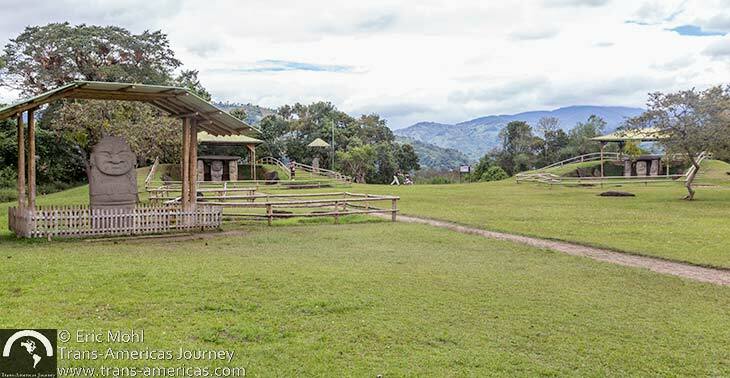 Just outside of San Agustín you will find two smaller sites called El Tablon and La Chaquira. 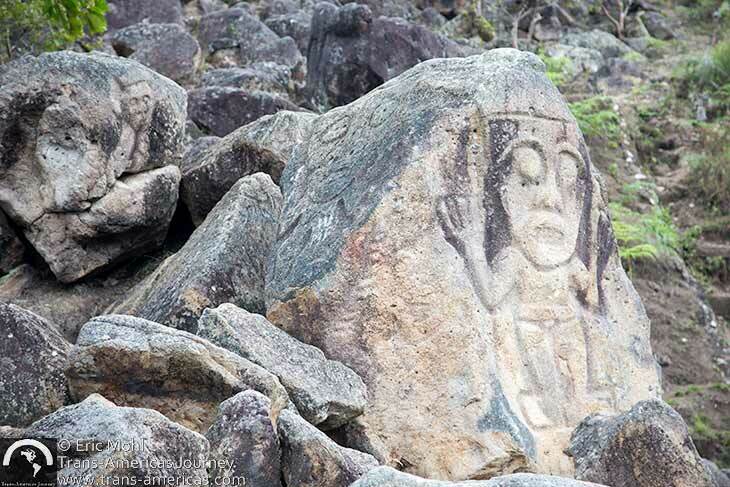 This rock face carving at the La Chiquira site overlooks the gorge carved by the Magdelena River. About 3 miles (4 km) southwest of the town of Isnos is the Alto de los Ídolos site. 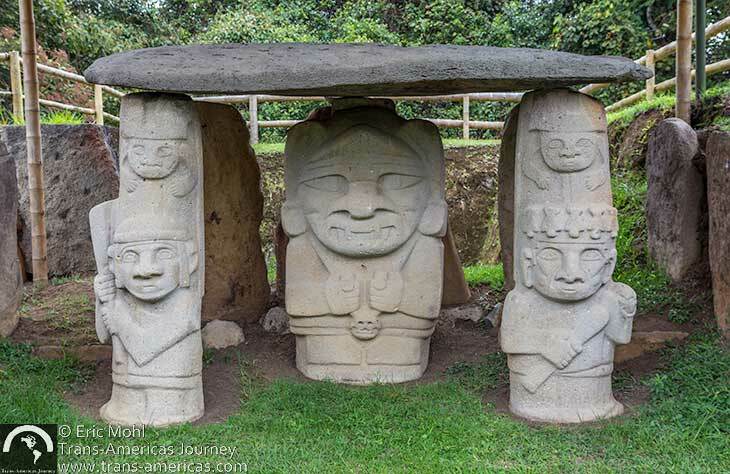 It is the second most important site after San Agustín and contains 23 anthropomorphic and zoomorphic monoliths including the tallest statue in the area at 22 feet (7 meters). However, only 13 feet (4 meters) is visible since the rest of this statue is buried underground. This carved stone image guards the tomb in the photo below. A sarcaphogus at the Alto de los Idolos site. Alto de las Piedras, 4.5 miles (7 km) north of Isnos on a rough road, is a smaller site but contains one of the most famous sculptures in the area, the Doble Yo. The famous Doble Yo at the Alto de las Piedras site. 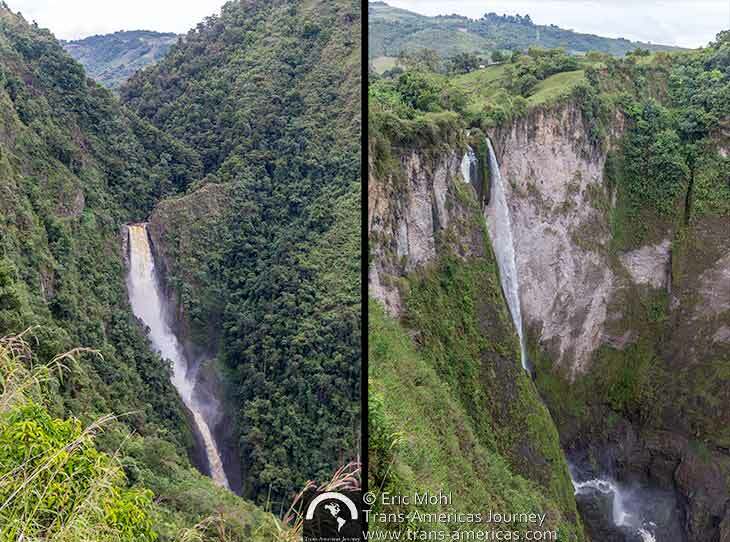 Continuing another rough 6 miles (10 km) past Alto de las Piedras you reach a viewpoint for the dramatic Salto de Bordones, a 984 foot (300 meter) high waterfall. Sadly, only the top half of the falls are visible from the viewpoint. A more accessible if somewhat smaller waterfall, Salto de Mortiño, is just off the highway on the way into San Agustín. When we visited this waterfall there were hundreds of parrots flying around. Salto de Bordones (left) and Salto de Mortiño (right). While we were in the area we also drove about 6 miles (10 km) from San Agustín town to Estrecho del Magdalena to see the mighty Magdalena River power through a very narrow stone chute (estrecho means narrow in Spanish). The Magdalena River as it squeezes through a narrow rock chute at Estrecho del Magdalena. While we loved the archaeological site and all the stone figures, it must be said that the town of San Agustín was substantially less charming than we’d hoped. We spent quite a few hours popping into one dumpy hotel after another before we found these recommendable hotels in San Agustín. Yes, you can find someplace to sleep for as little as 15,000 COP (about US$5) per person in San Agustín town. If you’re after a bit more comfort, cleanliness, and working Wi-Fi (as we were), then we suggest you head to the El Fogon restaurant in town and ask about the rooms they have upstairs which are clean, have lots of light, and working Wi-Fi. The downstairs restaurant offers decent food at decent prices too. The atmospheric and art-filled Akawanka Lodge just outside San Agustín town. People rave about Finca Ecologico El Maco, just outside of town, but it was full when we were there (and, honestly, looked a bit run down). Just past El Maco is the Akawanka Lodge where we stayed during the second half of our time in San Agustín. This restored traditional farmhouse is full of art and has an easy, eclectic vibe. Ample wrap-around porches (check out the hammocks made from strips of leather – they’re more comfortable than they look), a sprawling lawn and garden, a fireplace in the bar/restaurant, no TVs, and art everywhere make this a very relaxing place. A spa was in the works when we were there. 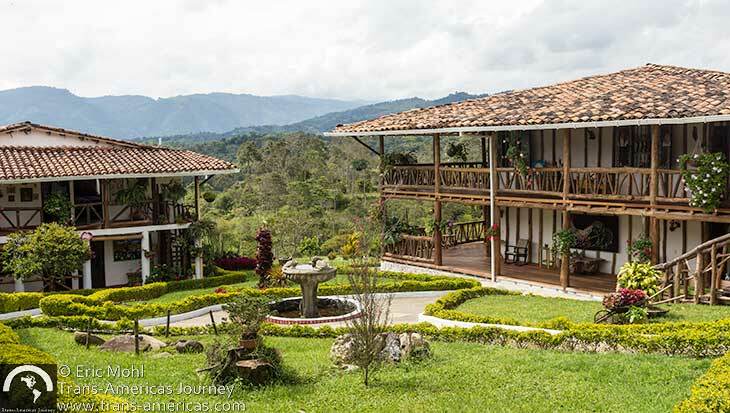 Here are other hotels that caught our eye in and around San Agustín, though we did not stay at any of these hotels so we can’t personally vouch for them: Terazas de San Agustín, Hotel La Casona, Finca el Cielo, and Hotel Casa Tarzan. Richard manning the grill at Donde Richard restaurant in San Agustín. As we said, decent food at decent prices is available at the El Fogon restaurant in town. 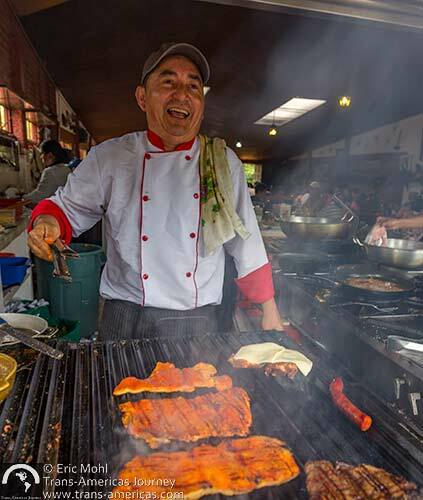 For expertly grilled meat, head to Donde Richard on the road between town and the San Agustín site. Huge plates of pork loin, chicken, beef, and chorizo (around 23,000 COP or about US$8) are big enough to share. Don’t miss the cerdo asado of tender slow cooked pork. Richard himself is usually manning the grill. Want more archaeology? 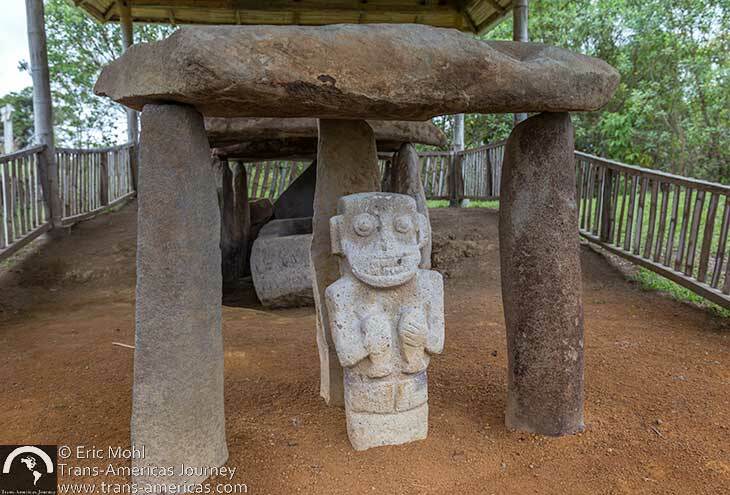 Check out our post about the more than 100 archaeological sites we’ve visited in the Americas. Another place worth visiting in Colombia – gotta get back there soon! It’s a really interesting place. Thanks for the great post.